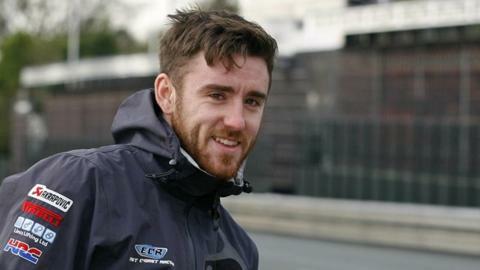 Young Northern Ireland road racing stars Lee Johnston and Jamie Hamilton will make their Macau Grand Prix debuts at this year's event in November. Johnston will compete on a Ducati with backing from RPM Performance, with Hamilton on a Honda for the same team. Three other Irish riders, Stephen Thompson, Davy Morgan and Brian McCormack, have had entries accepted. Michael Dunlop and William Dunlop are not among the entry after making their debuts in the Far East last year. The Ballymoney brothers finished 12th and 13th respectively on their first appearances at the 3.8-mile Guia circuit. Johnston made headlines when he secured a second-place finish in the first Superstock race at the North West 200 in May, and went on to perform well at the Isle of Man TT and Ulster Grand Prix. The 28-year-old Fermanagh man, now based in Hull, went on to make impressive debuts at the Isle of Man TT and Ulster Grand Prix, and has already agreed a deal with Millsport Racing for the 2013 season. Hamilton, 21, enjoyed a successful first full season on the roads in the colours of Ryan Farquhar's KMR Kawasaki team. Thompson, a Macau regular, will hope to make his return to action after suffering several injuries, including a broken vertebrae, in a crash at the Ulster GP in August. The entry list is headed by Midlands rider Michael Rutter, who sealed a record seventh win at the event last year. Other leading contenders include John McGuinness, Conor Cummins, Gary Johnson, Mark Miller and Simon Andrews.